We have often hear of this injury- an “ACL tear” or “cruciate ligament rupture”, but what exactly do these terms mean and how would we know if we have sustained an injury? Let’s have a look at the anatomy to become familiar with the knee joint. The knee is a generally stable joint which works like a hinge and provides great leverage to our lower limbs, permitting efficient mobility. Although there is a small amount of rotation available, the primary role of the knee joint is to allow flexion (bending) and extension (straightening) movements. There is also an element of “shear” force which the knee must withstand to prevent movement of the femur (thigh bone) on the tibia (shin bone). In order to prevent excessive amounts of this force, nature has provided us with strong ligaments inside the knee to limit injury via this plane. These are the two cruciate ligaments (anterior or ACL and posterior or PCL). The ACL is more commonly injured- often in contact sports, especially where rotary forces are commonly involved, such as stop- start or fast turning movements to change direction. Usually the movement involves some flexion at the knee coupled with rotation through the joint whilst the person is weight-bearing. 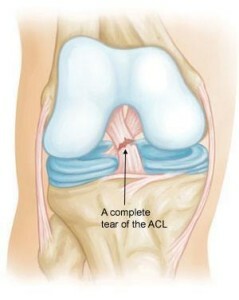 This action may result in damage to the ACL and the patient often describes a sensation of tearing when the injury occurs. 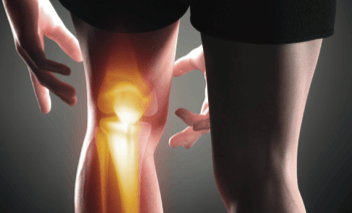 Damage may occur in isolation, but often other structures within the knee joint may also be involved, such as the cartilage (menisci) or collateral ligaments which support either side of the knee. In most cases an accurate early diagnosis offers the best potential outcome for Anterior Cruciate Ligament injury. It is common for the joint to swell within an hour of the injury, so RICE protocol is sensible immediately (Rest, Ice, Compression and Elevation). Diagnosis is made by clinical assessment, but usually confirmed by MRI scan. Often x- rays are also taken to rule out other bony trauma. At Chhabra Osteopathy, we have a team of osteopaths who endeavour to see people within 24 hours and can make this clinical decision. We can refer patients where necessary for scans to confirm the diagnosis. In some cases, surgery may be indicated in order to repair the damaged ligament, especially if the individual is keen to return to high level sport. In these cases, either a slip of hamstring tendon or a portion of the patella tendon is used to serve as a graft to make the “new” ACL. For other individuals, it is possible to offer good rehabilitation instead of surgery, which provides an adequate level of subsequent stability. The sooner this process can take place, the better the potential outcome for the injured patient. Work to rehabilitate the damaged ACL can start virtually immediately following injury. Initially RICE protocol described above will help to bring down the acute swelling. Next, full range of motion is encouraged in both flexion and extension, then a move to permit these ranges of movement in partial, then full weight bearing. Our osteopaths then aim to eliminate any limp and restore normal walking gait as soon as possible. Once the swelling has decreased and the range of movement is restored, closed chain kinetic exercises follow, such as leg press, squats, using an exercise bike and cross trainer. We also consider the role of the core muscles to maintain general stability for the patient. We then look to improve the range of joint motion and passive control of this by suggesting more strengthening exercises, along with swimming and hydro-therapy. Finally we permit single leg strength exercises and monitor a gradual return to sport. In general it will take 6-8 weeks before patients are able to jog comfortably following damage. If you think that you may have had an injury to your Anterior Cruciate Ligament, then feel free to call our reception on 020 8545 0965, or schedule an appointment online for an assessment and to start your rehabilitation.